Learning management systems were supposed to have died out by now, weren’t they? Swept away by a wave of 21st century platforms, mobile apps and MOOCs. In fact, in ELT, it feels like they’re only just getting going. Let’s have a look at the LMS market in general and see what the main ELT publishers are up to. In future posts, we’ll have a look at what we might expect in the future as mobile/tablet based learning continues to grow in importance and we see what I think is an inevitable blurring of the boundary between the LMS and the MOOC. You all know what an LMS is, right? If not, this snippet from Wikipedia is enough of a definition: an LMS is an online platform which handles the “administration, documentation, tracking, reporting and delivery of e-learning education courses or training programs”. So if that’s an LMS, what’s a VLE (virtual learning environment)? It’s exactly the same thing, unless anyone out there can give me a definition of the difference. ‘VLE’ is the term more commonly used in the UK higher education system, but it ELT we usually talk about LMSs. And it’s LMSs that most publishers use to deliver online courses in ELT. Even platforms that claim to be the alternative to the LMS (and that usually means they offer more ‘web 2.0’ features – social, user generated content) such as English360 do a lot of the same things as an LMS. LMSs have been used for years in universities around the world and have, over the last few years, been working their way into all areas of education as schools look to provide online learning. The main justification for their existence is that they allow for centralised administration of online and blended learning. However, there’s been a growing tide of opinion that they are the clunky and over-complex dinosaurs of the EdTech world, as new lighter, quicker to change, cheaper and more flexible options spring up seemingly every week. But the LMS is not on the way out. At the BETT show earlier this year, one of the most striking things was the vast number of new LMS companies that are springing up. The pitch is always something along the lines of ” You know how LMSs are over-complex, expensive and clunky? Well, we’ve come up with the solution!”. Reeled in by the pitch, you’re then shown what is…. yes, just another LMS. But these companies wouldn’t be springing up if no-one was buying their products, so the LMS market seems to be in good health. In fact, it seems to be diversifying (or fragmenting, depending on how you see it) after a period when it looked like Blackboard was about the completely sow up the entire market. The open source old favourite, Moodle’s been around for just over 10 years. There are over 80,000 sites out there using Moodle, and it’s still very widely used in ELT. Most of the usual features are available and new ones can be added in the form of modules. If you’ve got the expertise (or can hire someone who has), you can develop your own modules to do whatever you want. There’s also a thriving commercial arm of the Moodle world, with a host of companies out there (through the Moodle Partner Network) who can set up, customise and manage a Moodle environment. Can Moodle be used for large-scale serious learning? Well, the Open University in the UK uses it to manage courses for hundreds of thousands of students, so that’ll be a yes, then. In ELT, it tends to be widely used by schools and institutions who want to set up their own online platforms, but less so by publishers who tend to want to provide something a bit slicker in order to deliver saleable online courses. The big beast of the LMS world has been around since the late 1990s and until recently totally dominated the commercial LMS world, partly through its strategy of buying up competitors left, right and centre. These acquisitions have brought with them customers, talent and technology – for example, the purchase of Wimba and Elluminate provided industry-leading synchronous learning and virtual classroom tools, now under the name Blackboard Collaborate. The basic features are the same as for most other LMSs, although almost certainly more extensive. In fact, if you want to get a picture of the range of things that a big LMS can do, take the time to have a look at Blackboard Learn’s feature list. As with Moodle, it’s possible to customise and extend the platform’s features using ‘Building Blocks’. The usual criticisms levelled at Blackboard are its excess of features (and resulting complexity) and its highly commercial nature – it’s owned by a private equity firm, after all. I imagine most of those ‘excess’ features are there because users asked for them, though. 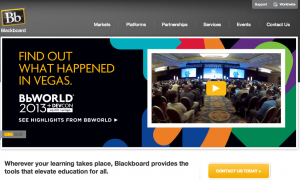 Oh, and in 2012 Blackboard purchased Moodlerooms, a company developing Moodle-based solutions. Moodlerooms has continued to operate under its own name, and touts its own Moodle-based platform, Joule. Finally, it’s worth saying that Blackboard has suffered some pretty terrible PR over the years, partly due to its expansionist ambitions (which just seem like sensible business to me), but also because of ill-judged attempts to try patenting the underlying concepts behind LMSs, including taking legal action against Desire2Learn. There’s a bit of a feeling out there that we’re witnessing a changing of the guard. Blackboard is certainly losing market share. Blackboard and Moodle are both old, even if they’re gussied up, like Joule. “More than an LMS”, apparently. D2L’s stated USPs are that it’s open, mobile-centric and extensible. Like Blackboard, it’s massively rich in features. Unlike Blackboard, those features weren’t developed incrementally over years or by bolting together various pieces of purchased technologies. So, in theory, that means it’s leaner and meaner – but much less ‘back to basics’ than Canvas (see below). D2L is certainly now one of the ‘big beasts’ of the LMS world, and is taking market share from Blackboard. Canvas launched in 2011, and was immediately heralded as a refreshing alternative to the feature-packed complexity of Blackboard and Moodle’s lack of polish. The key claim for Canvas is its simplicity. It’s designed to be quick and easy to get up and running. That does come at the cost of a lot of features that some people need or would expect in order to be able to run a course properly. Over time, they will be under pressure to add features, which will put the prized simplicity under strain. 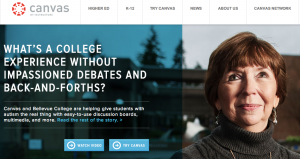 A more recent development is the launch of Canvas Network – Instructure’s entry into the MOOC market. Given the waves Canvas is making and the big VC investment behind it, I think it’s safe to assume it’s going to be a major player even if, right now, its hype is bigger than its user base. What are the ELT publishers doing? OUP signed a strategic partnership with D2L in 2011, with the aim of using the LMS for delivery of online materials. We’ve yet to see the fruits of that, and I’ve heard that it hasn’t been entirely plain sailing. One issue, I suspect, is that no major commercial LMS is designed for language learning. And big as OUP are in ELT terms, they may still be too small a client to heavily influence D2L’s development plans. Given the strength of the D2L platform, though, I presume something interesting will come of this. Pearson have their own LMS for ELT, MyEnglishLab (built by Polish tech company IOKI), which is used to deliver online components for all of their main courses. This gives them much more flexibility and control than OUP have. 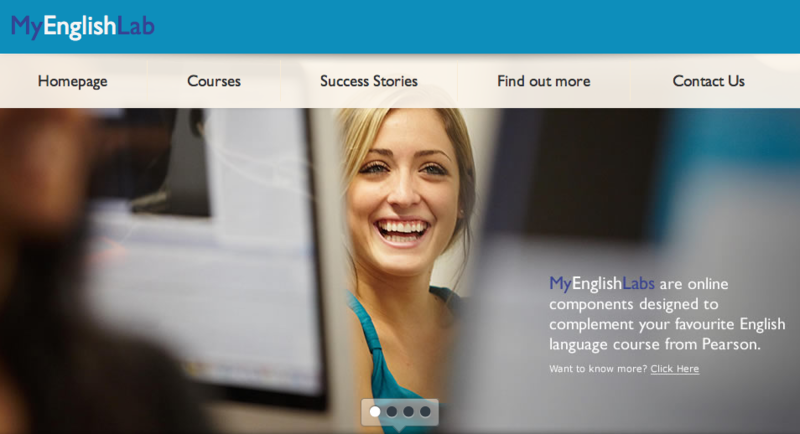 And MyEnglishLab seems simple but effective, with a reasonably clean and modern design. Obviously, Pearson are able to take the platform in any direction they wish, and adapt at will to suit the needs of their products. The downside is that it’s really hard (basically impossible) to keep up with the rate of development a dedicated LMS company like D2L or Blackboard can manage. 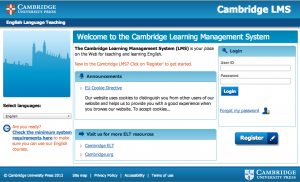 Cambridge also have their own – eponymous – LMS, originally developed for Touchstone Blended Learning. Again, that means the ability to develop the platform according to the specific needs of their products (and for language learning – not something uppermost in the thoughts of the big LMS companies), but it’s hard to remain competitive with the feature sets of the big LMS providers. (Disclosure – I work for CUP). 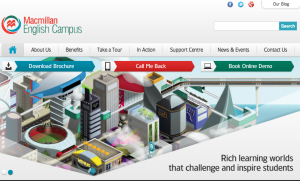 Macmillan English Campus has been around for a long time (10 years!) – it’s both a platform and a product. Word on the street is that for their future Knewton-powered online products, something new is in the offing, so while Campus may live on as a product, I don’t think we’re going to see the platform powering their big online courses. I suspect they’ll be going down the OUP route and partnering with an LMS company, rather than rolling their own LMS, a la CUP and Pearson, but we shall see. Schools – use a publisher’s LMS or get published content to run in your LMS? This is one of the big questions facing schools and universities wanting to provide online English language learning. If you already have Moodle running in your university to support courses in various subjects, do you want to run ELT content in that, or take on an integrated ELT online product which comes with its own platform? Compromises either way – stick with Moodle, and your ELT course won’t be as slick and may lose features; take the publisher’s platform and you have two platforms running which makes life complicated. Publishers – to buy or to build? I think the decision over whether to build your own platform or pay to use someone else’s is one of the most interesting and difficult ones for ELT course providers. There are so many pros and cons to each approach that there’s no clear right answer, as I think the ELT publisher examples above should make clear. I think different content providers will continue to try both approaches. 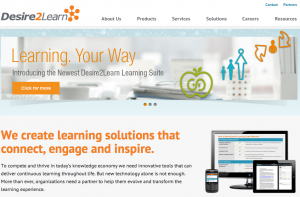 Will LMSs and MOOCs converge? Instructure’s Canvas Network and recent developments by Coursera to build more LMS features into their currently fairly basic platform suggest that the LMS and MOOC may be converging. Certainly any MOOC provider will have to begin providing richer feature sets – and that means developing their own platform, or partnering with LMS tech companies – so the same choice ELT publishers are having to make. Great and informative post, thanks. I think one differentiation between VLE and LMS could be in the word Virtual in VLE. So whereas an LMS can be used to manage all learning for an institution, online and offline, a VLE is designed only for online, virtual learning. In other words, you could use an LMS to organise a school trip to a museum. Thanks Luke. 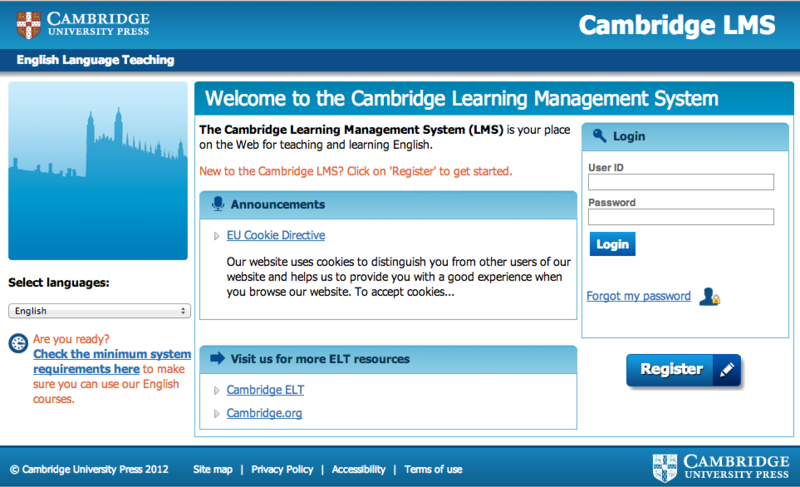 That sounds like a reasonable distinction between LMS and VLE – I’m sure there are others, too. And yes, always interesting to know what other publishers are doing. Have Richmond followed the CUP/Pearson path and developed their own LMS, or partnered with an existing one, a la OUP? Do you agree with the pros and cons of those two approaches I’ve outlined, or have any other thoughts on that issue? Yes, I am sure there are others and mine might be a little spurious but it makes sense to me. Personally, I think that publishers should focus on content, which is what we do best. We should strive to make that content as platform agnostic as possible — never easy! We can then provide a VLE to institutions that need one, as a complementary service, or just provide the content itself. So the Richmond VLE comes as part of the package we offer, at no extra cost, and we are working on creating some beautiful content that can run on our VLE and elsewhere. Now that was pushy! I think very interesting things are happening with the work rustic I software are doing with the old SCORM standard. Their new tin can api points the way to much more loosely coupled and semantically richer tracking framework that persists through standard web pages. So perhaps no need for any other application for grouping students and defining courses, just a record store and some bespoke front end design for each institution. I don’t work for Rustic I by the way. Yes, Tin Can has the potential to takes things in very interesting directions, including the death of the big centralised LMS platform. It may be that learning management becomes more of a background service, able to track student and teacher engagement with mobile apps, websites, anything really. Yes, I know Guided eLearning, and they’re doing some good stuff. I think their approach actually sits well alongside what the main publishers are doing, and we’re likely to see published content appearing in a multitude of different platforms over time. Like most online publishing companies / online language schools we (netlanguages) ended up creating our own LMS and have never regretted doing this – it’s given us a level of flexibility which is impossible with other commercial or open-source LMSes. We wasted about a year of our time trying to work with a commerical platform (SARAS) – a costly mistake! It’s true, from my experience, that content you license from publishing companies will work best on their LMSes so I wouldn’t recommend using a different one unless you have very strong reasons to do so. While I agree that having to use different LMSes for different products is not ideal, the people who make the decision of which LMS to use need to carefully consider whether the optimum experience that students, teachers /tutors and administrators will have with by using a platform designed for the courses they are using outweighs the inconvenience of using a selection of different platforms. We went through a time when everybody wanted everything to work on Moodle (Moodleholics) but my experience is that the Moodle bubble has burst and institutions are now much more receptive to using multiple platforms. Multiple platforms means multiple logins, multiple training, multiple administration… I doubt a small chain, (or even a large chain) would really want to go for multiple platforms – it’s too much hassle. Not really, it doesn’t mean multiple logins (you can log in to different platforms from the same login) and most platforms are pretty intuitive for administrators. I’m just sharing our experience, we deal with small and large corporate and educational clients around the world and although we can put our content on different platforms (it’s SCORM compliant), it only happens in the minority of cases. The majority don’t see it as being an issue, maybe because they don’t have a preferred platform, or maybe they don’t want to commit to one platform …. things change (as Laurie’s post makes clear), and the risks can be high commiting to a platform which then doesn’t evolve as you would like. I can only speak for our experience at CUP which is that schools and universities are definitely willing to use a publisher’s LMS if that’s the best way to deliver the course they want. Portability of content is still an issue, but not as big as I would have predicted if you’d asked two or three years ago. And, as Fiona says, there are partial solutions, such as single sign-on. I agree Laurie that one of the crucial questions the publishers have to face is whether to buy or build a platform. If you buy one you have to adjust, lean your finished content to fit into the requirements of the LMS. In the adjusting process you will certainly lose quite a lot of the advantages of your content. If you build one from scratch you will have to invest a lot of money and time to train your developers (authors and editors), the reps, the teachers, and on the other hand, you most probably lose the option that your content should be run on other platforms. I think both options can work. If you build your own, you need very considerable in-house technical expertise and, as you say, resources to train reps, teachers etc. It can definitely be done and work well, but it’s very expensive. If you buy one in, then you have to bend your content fit the platform to a greater extent, so there’s a bigger challenge there for your product development teams (editors, production people etc). Swings and roundabouts! That opens up the question of whether publishers should consider themselves as primarily content businesses, or more as service providers. The trend for the big publishers in ELT is towards the latter. Thanks for this very informative post! And what do you think of LMS Haiku? Is it “a big beast of the LMS world”? I’ve been using it for a year and liked the simplicity of the interface. Glad you liked the post, Julie. I haven’t played with Haiku yet, so can’t really comment. Thanks for bringing it up. My understanding is that Haiku is aimed very much at the K-12 market, while Canvas is more focussed on higher education. Probably more ‘new wave’ than ‘big beast’, but I don’t feel qualified to say for sure right now. I’ll have to spend some more time checking it out! Interesting read. We’re just getting started in edtech. I’m really enjoying your series so far. I used BB in college, but canvas looks so refreshing!